Pickering-Beach Museum: the oldest museum in the town, located on West Main St. near the War of 1812 battlefield in the Joshua Pickering home. Sackets Harbor Vistor Center: headquartered in the 1801 home of village founder Augustus Sacket. Lake Ontario Playhouse: a comedy club located in the old I.O.O.F. building on West Main St.
Madison Barracks: oldest military installation in the county, established in 1817 and now a resort and residential community. War of 1812 Battlefield: includes details on the site as well as reenactments. Candlelight Bed & Breakfast: located on West Washington St. adjacent to the War of 1812 Battlefield, in sight of Lake Ontario. George's Back Room: located on West Main St. in Sackets Harbor. Jacob Brewster House Bed & Breakfast: located on Broad St. in the village of Sackets Harbor. Old Stone Row Country Inn: located in original War of 1812 officer's quarters at Madison Barracks, built in 1817; Pres. Ulysses S. Grant had quarters in these buildings before the Civil War. 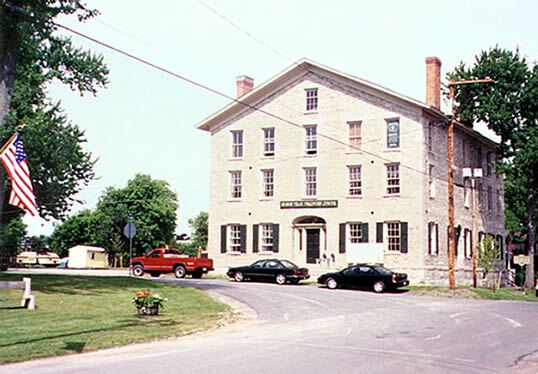 Ontario Place Hotel: located just off Main St. in Sackets Harbor in the old Calavo factory, overlooking the harbor. East Hounsfield Free Library: location and hours of operation. Hay Memorial Library: official website of the only library within the village of Sackets Harbor. Sackets Harbor Chamber of Commerce, includes current information on lodging, dining, shops, recreation, churches and history! Sackets Harbor Historical Society: official website. Old McDonald's Farm: family-oriented petting zoo on Rte. 3 just outside Sackets Harbor. Westcott's Beach State Park: official New York State Office of Parks website. Sackets Harbor Brewing Co., a microbrewery and restaurant on West Main St.
1812 Steak & Seafood, a restaurant housed in one of the oldest buildings on Main Street and a center of village social life for decades.